Dale's Principle and Communication Between Neurones is based on a colloquium of the Neurochemical Group of the Biochemical Society, held at Oxford University, July 1982. 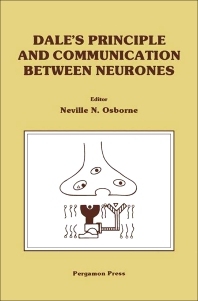 This book focuses on communication between neurones by means of chemical signals. The book contains an introductory chapter by V. P. Whittaker and nine further chapters on various aspects of the chemical communication processes between neurones. Topics covered include chemical communication between excitable cells; the neuroendocrine division of the nervous system; evidence for a neurone having the capacity to use two chemicals in the same process; and non-synaptic interneuronal communication. Each article is based on the excellent lectures given by the main authors and the discussion which ensued in the one-day colloquium held in Oxford. The final chapter is a specially invited contribution by Drs. Polak and Varndell, who agreed to produce an article on their new method of localising transmitter-like molecules at the electron-microscopic level.